In January, it’s sort of customary for me to write a satirical post on New Year’s resolutions. They’re easy to make fun of, and I’m the poster child for New Year’s resolution fails. My heart’s not in it this year, probably because I actually have a resolution, and I’m serious about it. You see, 2014 punched me in the face, and I had to make some lifestyle adjustments. Sadly, one of the first luxuries to go was my indulgent writing schedule. Don’t get me wrong—I’m still writing, and you’ll see a bunch of new books from me this year, including more in the Rougemont series, Brotherhood of the Falcon series, as well as Network One series. I’m very excited about these new projects, and I hope readers will like them. I’m just not as fast as I want to be. Pretty sure I killed a tree last semester. Sorry, tree. It was either you or Anatomy & Physiology. Apparently, when the going gets tough… the tough go to nursing school. Actually, I’m in EMT school, waiting to get into nursing school, and I spent the past summer and fall cramming in all 21 prerequisite credits. Way too much of my writing has been about vaccines, bacteriophages, and heart arrhythmias. Definitely not heroic or romantic, but believe it or not, it’s given me ideas for a few new books. Don’t worry, I’m not all sad violin music today, I have a dessert recipe to share, one of my favorites. Read on! Moriah’s No-Bake “Healthy” Double Chocolate Cookies… or, if you ask her children, “Moose Poop.” Yum! The holiday whirlwind finally died down, and if you’re like me, you indulged your sweet tooth and are regretting it a bit. 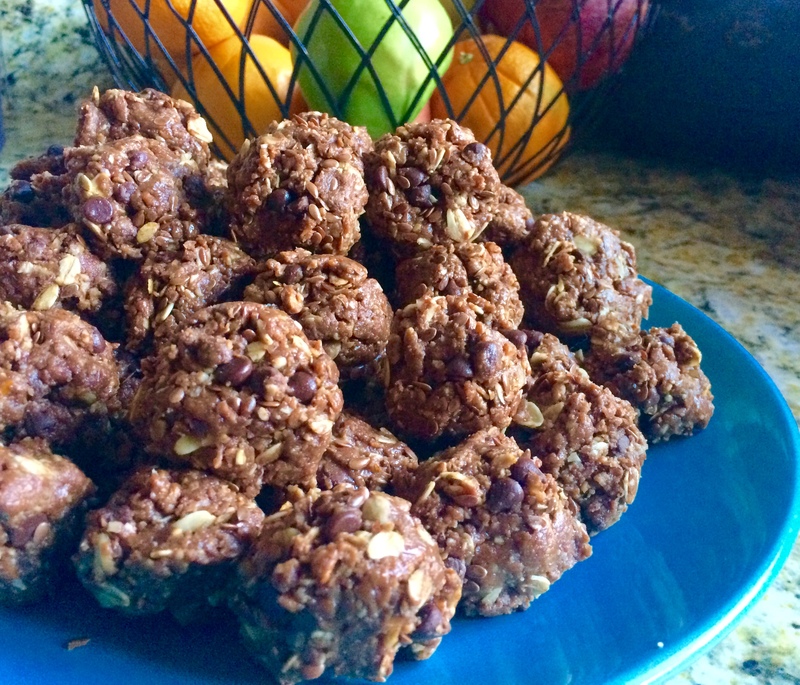 Don’t quit cold turkey, try my fabulous no-bake double chocolate oatmeal cookies, with a nutritious twist! Easy to make and oh-so delicious, this heart-healthy dessert is the perfect compromise between a little holiday indulgence and your New Year’s resolutions. * Try toasting the nuts and coconut flakes in a skillet on low heat until golden brown to add flavor. Optional: 12 ounces (1 bag) mini chocolate chips, or try toffee, butterscotch, or white chocolate chips. Mixture should be thick and hold its shape. Add oats if it’s too sticky, or add honey if it’s too dry. Scoop spoonfuls onto wax paper or a cookie sheet. Chill in the refrigerator to set, then enjoy! You’ll be glad the recipe makes a few dozen cookies, because they go fast. Keep covered, and they’ll stay good for up to 2 weeks. P.S., A perfect companion to the no-bake cookies is my diet peach smoothie. « Box Set Bonanza Giveaway & Scavenger Hunt! Good luck on your resolution! I hope you kick life back this year. Those cookies sound delicious. Hey thanks, Susie! haha punched in the face, kick back–yes, life is a fight sometimes, isn’t it? Hope your new year brings good books and chocolate, and no punches. Moriah, hang in there!!! Everything will work out!!! Good luck with EMT training!!! I’m sure you will be awesome!!! And as for the writing your fans will be here for you when things settle down!!! I will always being your corner rooting for you!!! Take care and God bless!! Hiya, Lisa! Always a pleasure to hear from a friend. Thanks for the encouragement, and you’ll hear from me soon, because I’ll want to ask for your feedback on the new book 🙂 Stay tuned! Hope your holiday with the family was a good one. Congrats on the new chapter in your life and good luck at school – can’t wait to see medical terminology working it’s way into your books! And I love those types of no bake treats – I have a recipe for an energy one similar to yours, but you have more yummy items mushed in there – apparently I need to buy cocoa powder, I’ve seen a lot of good recipes with that! Heh. Yes, Kate, I’ll try not to go overboard with the science-y stuff. No amoeba romance forthcoming, I promise! I’m a big fan of no-bake cookies too, and I think the honey & cocoa taste just as good as cooking a syrup sauce. Easier, too. Let me know what you think if you try it, I’ll want to hear from a connoisseur! Congrats on your new training and yay, more Rougemount books! Isn’t that how it always works though? We get inspiration for writing from so many different aspects of our lives. Happy New Year, Moriah! Hi, Pema! Thanks for visiting, always lovely to hear from you. Wishing you wild success on your books too–be sure to let us know when the next one releases! Please don’t try to wear yourself out too much! Always love to read your books, but not at the expense of temporary author insanity from overwhelming life. Lol. Hang in there, you are a spectacular woman. Sounds exciting. But also dangerous, difficult work. I know you will do well, however, with your dedication. Aww so that’s what you’ve been up to. Wishing you luck on the program and for this year to go your way. You’re doing great! Hi there, ki pha! Always a pleasure to hear from you. Thanks for the kind words!